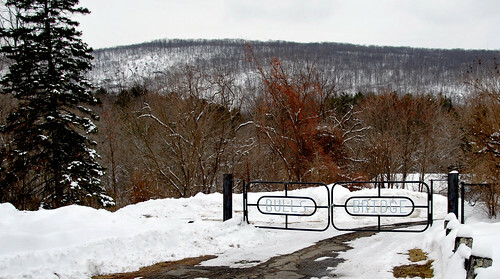 As busy as it was last week, I just couldn't pass up the opportunity to head over to the other side of Connecticut this past Saturday and pick up Princess Patti of Ansonia in the Valley so that we could trek through the snow in search of photographs in western Connecticut. Truth be told, I think that we both dearly needed a Girls Day Out in order to "blow off the stink" as I put it and I'm always up for a road trip to check out new places. 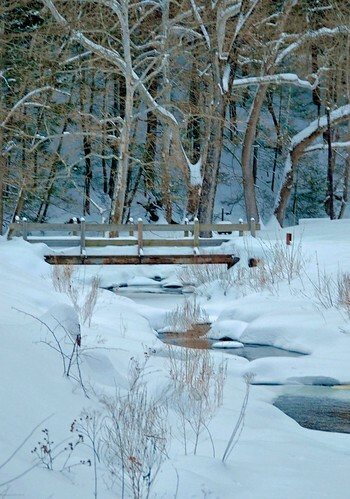 Besides, I wanted to take advantage of a bit of a break in the weather and see if I might be able to get any good potential photos for this year's Christmas cards; with the amount of snow we've been getting winter scenes are in abundance and then some! 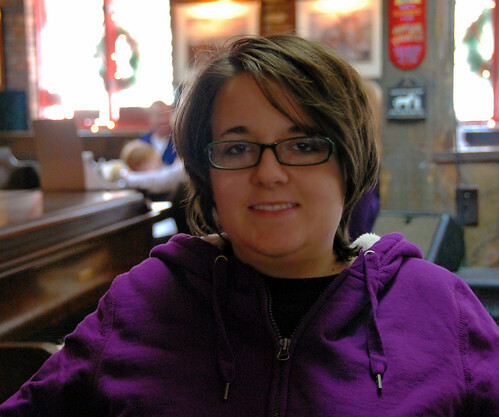 Jamie decided at the last minute to go along with us as she didn't particularly want to stay home alone all day so we drove over to Ansonia and arrived around noon to pick up the Princess. From there we headed in a northwesterly direction towards the small town of Kent where I knew there was not only one of Connecticut's three historic covered bridges but also Kent Falls which is sometimes considered the highest falls in the state though it's actually a series of waterfalls and cascades that drop 250 feet over a quarter of a mile. 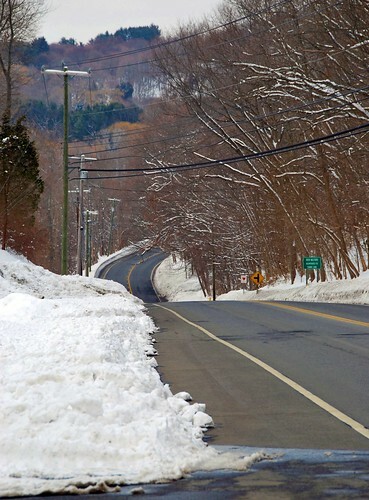 We've had so much snow this year that it's made driving pretty difficult - not so much because it's on the roads but because it's piled up so high in places that cars can't see when they're accessing the road from parking lots and driveways and the like. Patti and I had two near accidents from people backing out into the roadway before we were barely out of Ansonia and I had a chance to show off my quick brake reaction times as well as how quickly I could accelerate when I was the one doing the pulling out and couldn't see if there was anyone else coming down the road. After two road trips with me, Patti probably thinks I'm one of the world's worst drivers though she seems to do very well as a passenger and hasn't gasped once - that I know of! We made a quick stop at a "scenic turnout" just before we got to New Milford and Patti and I both got out of the car to take some pictures of the scenic landscape laid out before us. 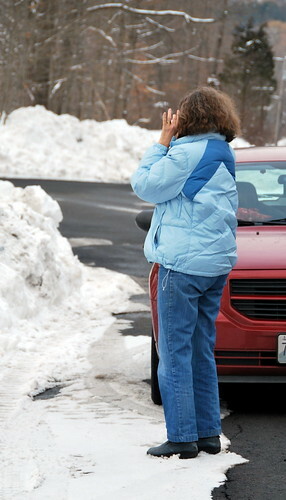 Or at least we tried to but when we got out of the car, the snowbanks were piled so high that it was hard to take a picture over them! 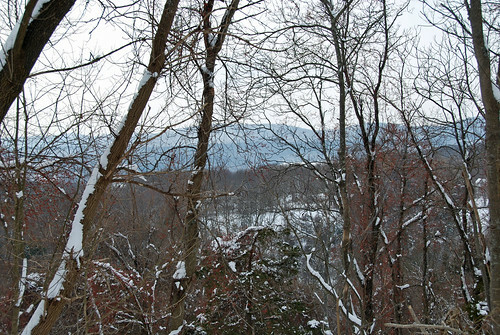 Unfortunately what I ended up with is the picture below ... a lovely view of bare branches with the foothills of the Berkshires just barely peaking through! Not exactly what I was hoping for! 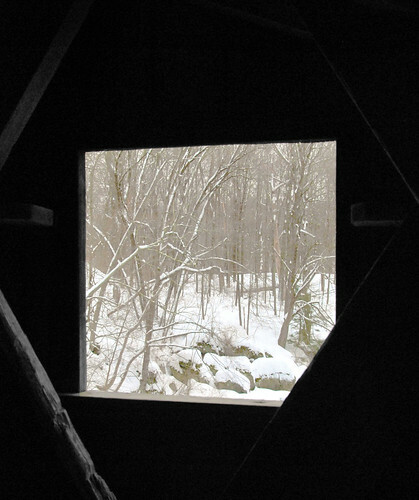 Even though we did see a lot of very scenic vistas on our drive, there was no place to pull over and take pictures so a lot of snow-covered barns and such went un-photographed by ourselves. Upon arriving at our destination - the small town of Kent which is located along the New York border and voted the #1 2010 Top 25 Foliage Towns in New England by Yankee Magazine - the first order of business was lunch as I was getting downright hungry having skipped that most important meal of the day - breakfast! Having done a little bit of research prior to our trip, I figured the best spot for us to do lunch was going to be the Fife 'n Drum Restaurant which is a bit of Kent history. The restaurant, which was opened by an Italian pianist from New York City who wanted to bring a fine dining establishment to a sleepy New England village, welcomed its first customer on January 20th, 1973. 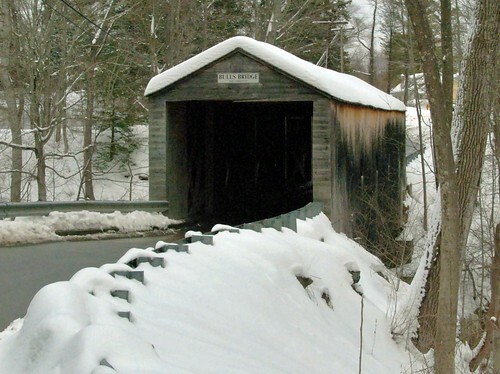 That customer was Mr. Eugene Bull, Kent’s Postmaster and a member of the family who first built the covered bridge south of town. Dolph Traymon was 50-years old when he first opened the Fife n' Drum complete with a Steinway piano bar where he still tinkles the ivories. After four decades of operation it's become quite the Kent "hot spot" ... in spite of all the icicles that were hanging from its eaves on the day of our visit! And yes, the icicles were almost touching the snow that was piled up in front of the restaurant! 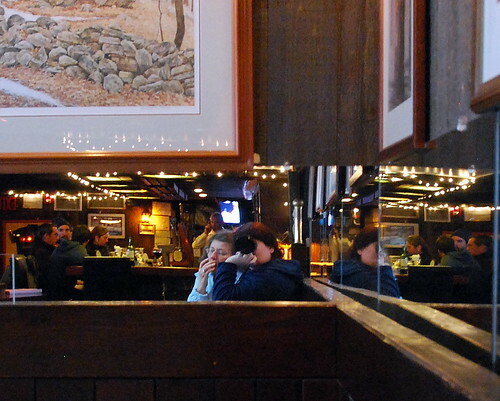 Even though it was late afternoon when we arrived, there was still a pretty good lunch crowd occupying the "David Armstrong" room where prints that are a tribute to Kent by the late local artist adorn the walls. It was in that room that Jamie, Patti, and I found a seat and watched the black bow-tied and vested waiters cater to their customers while Dolph himself walked around the restaurant making sure that everything was in order. 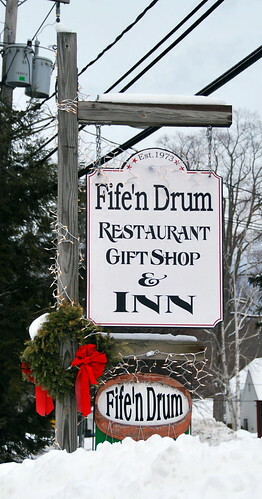 In addition to this room, the Fife 'n Drum also has the "Eric Sloane" room which is the more formal side of the restaurant boasting walls that are decorated with signed artist proofs by the late New England artist Eric Sloane, an American landscape painter and author of illustrated works of cultural history and folklore. There was a private wedding party occupying that room. On the other side of the "David Armstrong" room where we were seated is the "Glass Room" which was opened as part of the restaurant's 30th anniversary and was formerly part of the parking lot. That room was all set for what looked like a private party to come in and it looked bright and cheery in spite of the dull gray clouds outside. 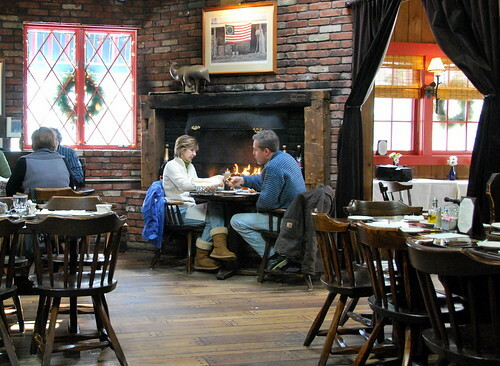 The picture above shows a couple happily dining in front of one of the restaurant's two fireplaces with the "Glass Room" just to their right. Just as an aside, it's not a real wood-burning fireplace but it does add ambiance to the room and the couple in front of it seemed to be quite comfy and cozy! After placing our lunch orders (French Onion soup for Jamie and cheeseburgers for Patti and I), I took a quick picture of Jamie before I handed her the camera and asked her to take a picture of Patti and I together - something I don't normally do but I thought it might be nice to mark the occasion with a photo! Following that I decided to fool around with the camera a little bit in the mirrors that were to the side of us! At that point I believe that Patti was enjoying some of her cheeseburger while other patrons were enjoying the bar! After lunch I snapped this quick picture of the icicles hanging near the front door on our way out to the car as I told Patti that I am dubbing this to be "The Year of the Icicles" as I've just never seen so many or such large ones before! I've got to admit, I was rather pleased with this picture as I managed to capture some of the water dripping; pictures like this make me think every great once in awhile that I actually know what I'm doing with a camera! Leaving the Fife 'n Drum and the center of Kent behind, we backtracked a little and next made our way south to the Bulls Bridge Scenic Area in search of covered bridge pictures. 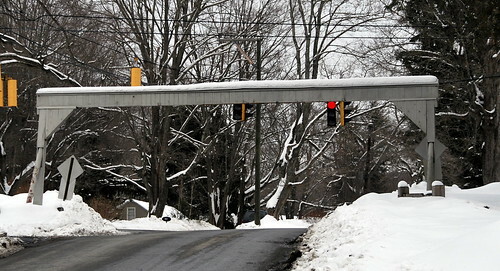 It's actually quite easy to find as a) the bridge is located on Bulls Bridge Road right off of Route 7 and b) the height barriers on the main road are pretty much a dead giveaway! 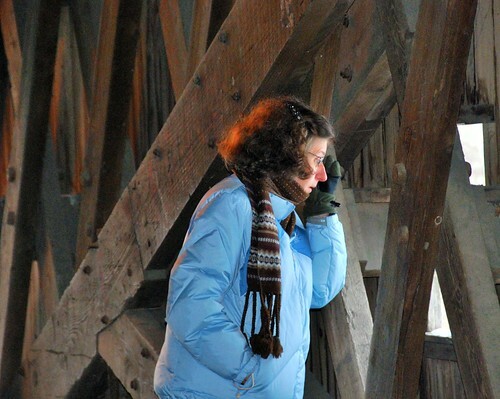 Fortunately there was a plowed parking area just to the other side of the bridge so as Jamie, who had said after lunch that she wasn't feeling too well and had curled up in the back seat to take a nap, continued to snooze away, Patti and I climbed out to do some 'xploring! 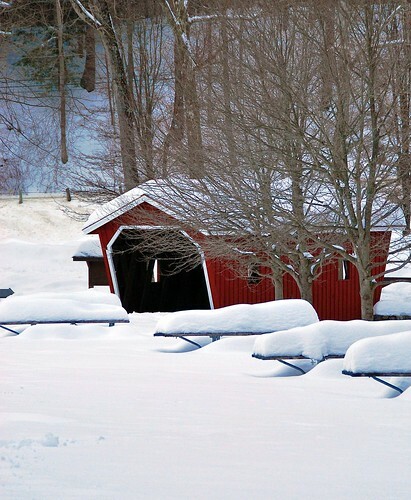 Located nearby a spot where George Washington crossed the Housatonic River in 1781, the bridge was named after Jacob Bull who was given permission to erect a grist mill and iron works at this point in the early 1770's. 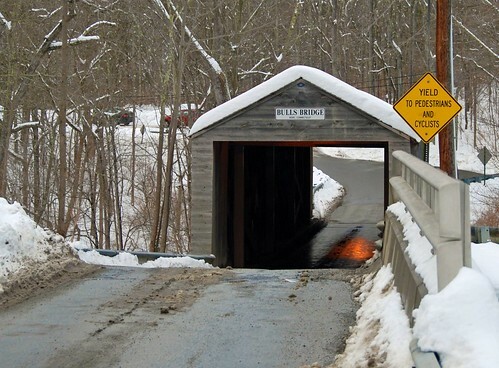 Several bridges have stood in this same spot with the current bridge being built in 1842 in the lattice truss design. 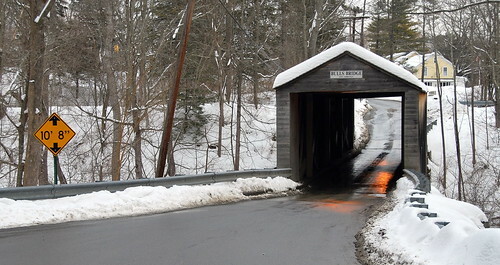 The bridge was listed on the National Register of Historic Places in 1972. 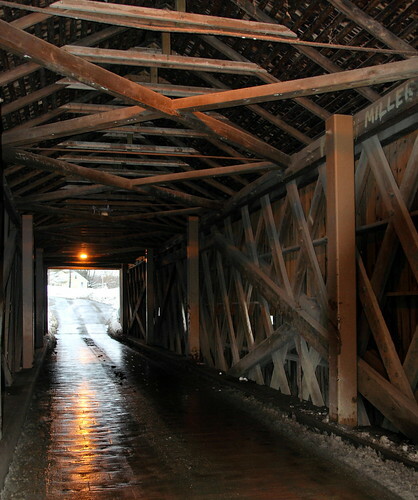 Queen Post trusses were added for additional support in the late 19th century and in 1969 large plate girders were installed beneath the bridge to carry the weight of the traffic. The exterior sheathing of the bridge was extended to conceal the girders from view. 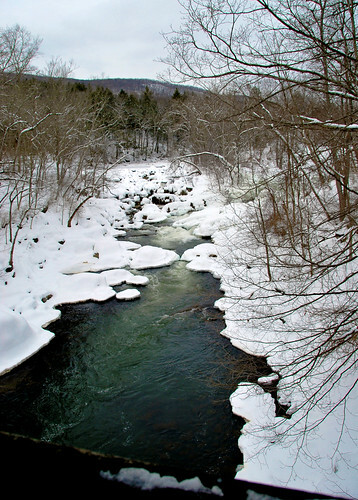 The part of the Housatonic River that runs under Bulls Bridge is quite popular with kayakers from all over - when it isn't frozen! 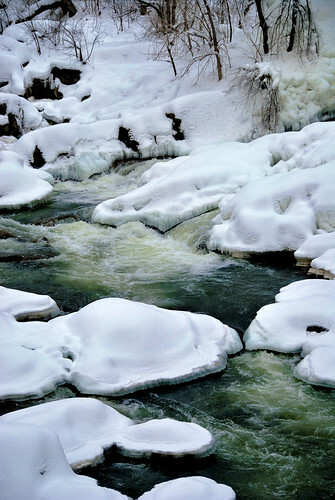 - as there are rapids along with a waterfall and small gorge. From what I've read it's actually pretty dangerous water so those walking along the trails that encompass part of the Appalachian Trail need to be really careful. Obviously there was no way that Patti and I were going to be doing any trail hiking so we settled for taking pictures from the bridge! 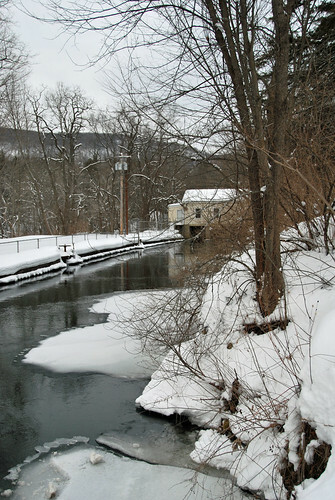 To the east of the bridge is a dam and canal that is part of the Rocky River Power Station that was built in 1917 by Connecticut Light and Power in order to harness the power of the Housatonic River; it's that system which creates the waterfalls and rapids in the area. I would be willing to be that this view is pretty spectacular in the fall with some color on all those trees! I was rather surprised by the amount of traffic that crossed the bridge while we were there as, truth be told, Kent is kind of in the middle of nowhere and not exactly hopping and popping with tourists on cold and dreary January days. Traffic here is especially tricky as it's a single-lane bridge and only one side has a stop sign for traffic so you really do need to proceed with caution - especially coming down the hill! 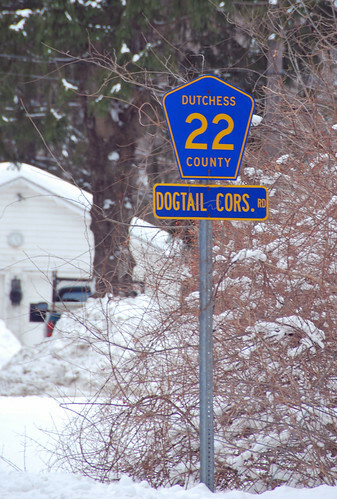 Of course I just HAD to take a picture of the highway sign being that I am a Duchess and I had just crossed over and back into Dutchess County! It was really only fitting. I was kind of surprised that there wasn't some sort of sign saying one had crossed a state line but I guess you can't have one everywhere, can you? Once we got our bearings and figured out which direction we needed to be going, we hopped back over the border and from Bulls Bridge we continued on our journey making our way north to Kent Falls State Park, one of the oldest state parks in Connecticut which is sometimes referred to as “The Jewel of the Inland Parks” due to its scenic view of 17 different waterfalls. 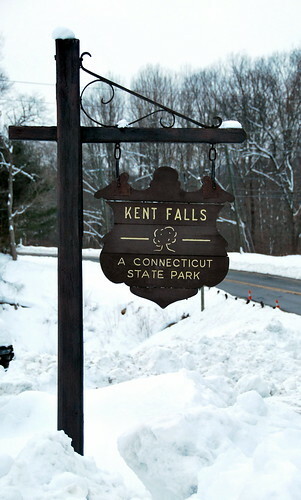 Kent Falls, a two-stage waterfall that drops approximately 70 feet through Kent Falls Gorge, is fed by wetlands from the town of Warren which eventually empties into the Housatonic River located across the street from the park in a hemlock grove. 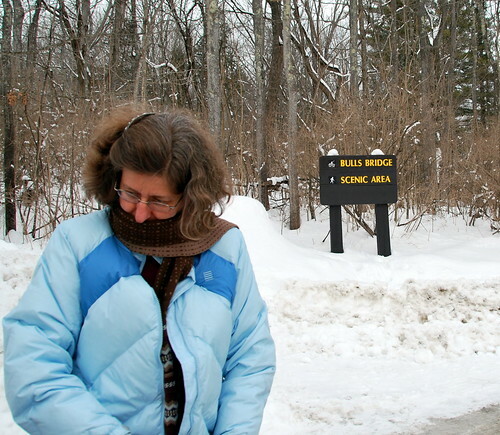 Patti had been to Kent Falls before but this was my first time in the area and I was rather surprised how the park was located right off of the roadway. I was expecting some sort of long drive in as seems to be the norm with Connecticut State Parks but thankfully that wasn't the case this time as it was starting to get close to dark and I knew we weren't going to have a lot of time for pictures. 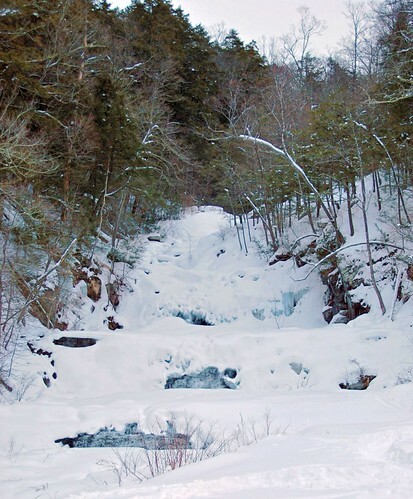 While Jamie continued to nap the day away in the back seat, intrepid New Haven Register reporter Patti and I climbed back out of the car and made our way towards the snow-covered falls through the snow-covered fields. Luckily someone had beaten down a path for us so as long as you stayed on it, it wasn't bad but if you stepped off you found yourself in snow up to top of your thighs - as I once found out when my boot slipped! If you look closely in the right hand corner of the picture, you can see the area where the falls are - underneath all that snow! This footbridge was downstream a ways from a small red bridge. 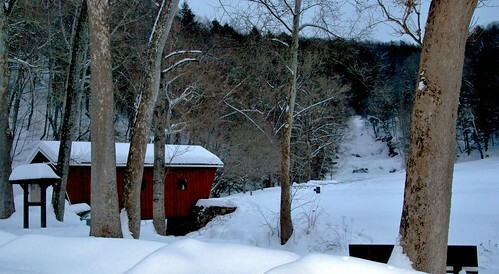 Not a historic covered bridge, this cute little 37-foot pedestrian bridge which crosses Kent Falls Brook was built in 1974 as part of the state park. 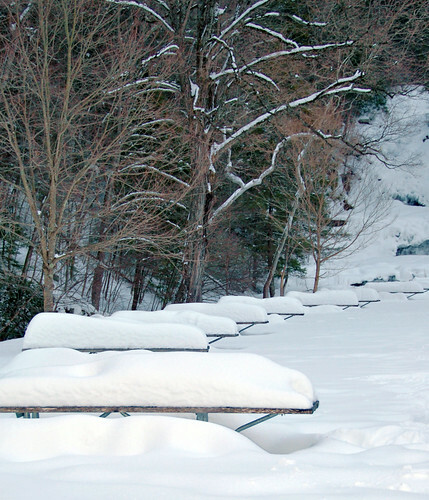 There were plenty of picnic tables available! 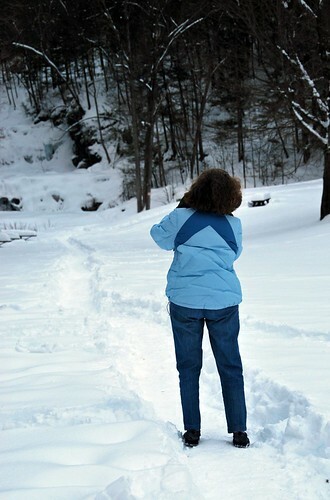 I let Patti lead the way on the path just so I could take her picture without her knowing! I'm sneaky like that! As you can see, the majestic falls were pretty much frozen and with the fading light and tons of white snow it was kind of hard to get a good picture. Patti said that we should come back in warmer weather with her husband Ralph and a picnic lunch which I'd most definitely like to do. 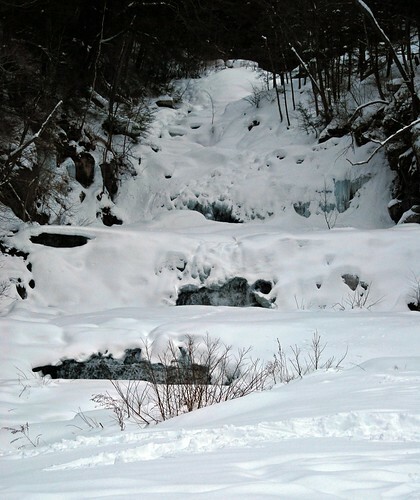 Then we could climb the trails next to the falls and enjoy the scenery without feeling like we needed a keg-carrying Saint Bernard along for company! With the sky starting to darken even more than it already was, we trudged our way through the snow back to the car and started our drive back towards Ansonia. We ended up going back the same way that we had traveled when we had gone on our foliage hunt in October but boy, did the scenery look different this time! Still, it's nice to explore parts of Connecticut that I've never seen before and it's even nicer to do that exploring with a friend. 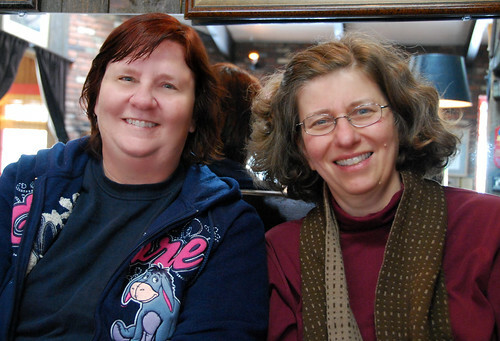 In spite of the near-accidents and the cold and all that snow, I really had a good time spending the afternoon/evening with Patti and I sincerely hope we get the chance to do it again many times over. Minus the near-accidents, the cold, and the snow though! Oh, and for the record - Jamie slept the entire way back to Norwich! well, I haven't read this yet, but it sure is long! And why didn't I see you taking pix of me? beautiful photos and what a beautiful place. I love those icicles hanging! Will be thinking about you the next few days--here you guys are in for some serious snow. and i laughed so hard at the "blow the stink off", my grandmother used to say that all the time, go outside and blow off the stink! haven't heard that in so long! What Miss Bee said! LOL! I love going along on your adventures! 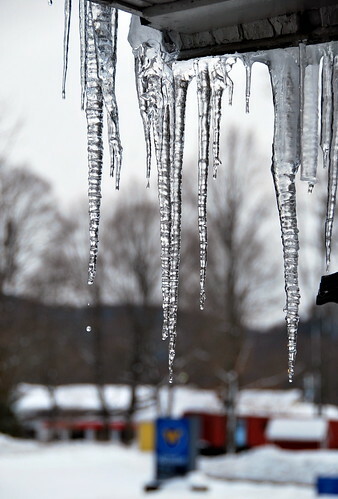 Of all the wonderful photos in this post, my favorite is the icicles. 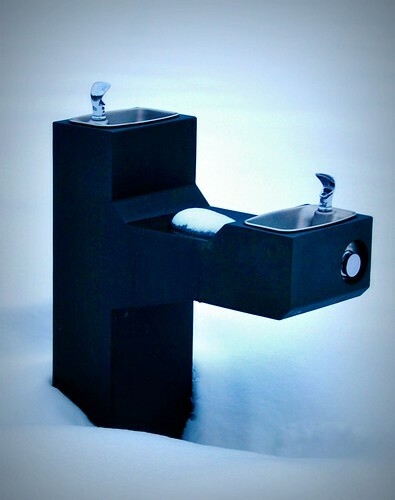 Great depth, focus, drippy-ness, and it certainly conveys the starkness of nature and the chilly temperature of winter. I think Old Man Winter is mad at someone up there this year. Just saying. Beautiful pictures as always. I msee the roads are clear...something we never get when it snows in Britain. I hope you're warm and safe, riding out this current round of weather. Looks like it was a very successful girls day out. I am soooo loving that photo of the couple by the fireplace. The restaurant should use it to advertise for Valentine's day. There's just something very great about it. I love the other pictures you froze your arse off to get, too. 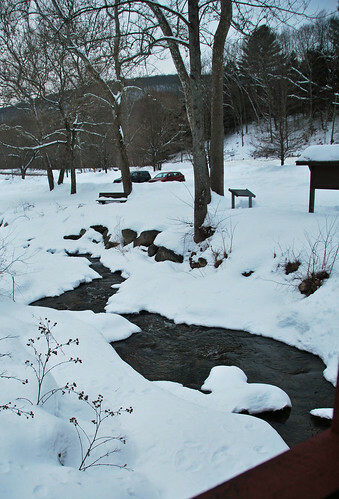 I am starting to think its time for a little winter getaway with my MAC's. Wonder if I could convince him?!?! We never did make it up your way for that car. Bought one in Lewisburg, PA instead. Maybe if I find a car in the destination I'd like, we'd stand a chance. haha. I am fortunate to have you to do research for me. Thanks for the all the info about where we went. The drippy icicle shot is a good one.